For women, I think fear is as natural as hormones. Actually, the two have a lot in common. They both can control the stink out of us. And, they can ruin an entire day before we even realize what's come over us. Er, at least I think I'm not alone in this. Can I get an amen? Fear of failure. Fear of rejection. Fear of not being good enough. Fear of loss. Fear of saying the wrong thing. Fear of looking the wrong way. Fear of having the wrong stuff. I've lost a lot of mind battles because of the sheer presence of fear. This evening, I was curled up in my new bedroom on my bed. Just like always, I had my inspirational tunes filling the air and my snuggie wrapped tightly around me. And, I just sat before the Lord and asked Him to pour His truth into my life. He centered my mind on fear. He took me to countless references in the Bible where we are commanded to have NO fear. That's right, fear is a sin. Did you catch that? When we allow fear to control our thoughts, we are actually doubting God's goodness in our lives. I can assure you that I have a constant battle with fear. The mental/emotional and spiritual battle of a cancer diagnosis is hard. Very hard. It's constant. But, God has shown me a fail-proof way of stopping fear in its tracks. Wasn't that easy? The very opposite of fear is faith. 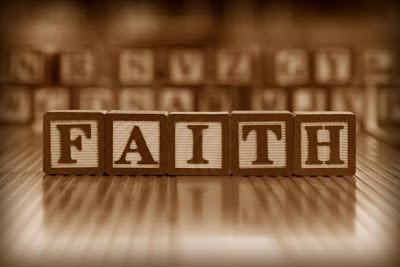 According to Hebrews 11:1 [NLT] "Faith is the confidence that what we hope for will actually happen; it gives us assurance about things we cannot see." I have so much that I want to tell you today about what the Lord is teaching me about faith in Him, ALONE. But, I don't want to get long-winded. I understand the appeal of short reads. So, I think that I'll just get to the bottom line. The opposite of fear is faith. Faith is believing that God has a good plan for our lives, even when the situation seems impossible. My charge to you today is for you to take a long look at your thought life. What do you spend your time thinking about? What is consuming your thoughts? Are these thoughts from the Lord and the hope that He gives, or are they Satan's lies? Choose faith, dear one. Hope in Him. Believe in Him. Trust in Him. Let's let His work continue in each of us. I'm trying my very best to allow Him to renew my mind daily. Will you join me?